Nursery operators need a nursery greenhouse that is functional as both a production facility and a retail space. Growers Supply has been designing and building the industry’s best nursery greenhouse for decades. Growers Supply creates GrowSpan greenhouses and growing structures, which ensure nursery owners can gain complete environmental control and also provide a beautiful space that has plenty of room for growers to work and customers to browse. Since retail greenhouses need to be functional and provide a space for customers to browse, they often have a unique set of requirements. These structures can come outfitted with custom benching, which is perfect for displaying plants of any kind, and anything else retailers need to produce and present crops of any kind. Greenhouse Specialists with years of retail experience are on staff and can offer invaluable advice on creating a function greenhouse that also has aesthetic value inside and out. With custom and stock options, each GrowSpan customer can create the structure that is right for their business. Designs customized to any business. Every project is handled by a Greenhouse Specialist, who ensures each project is completed correctly and every nursery need is met. 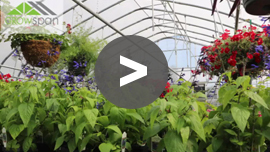 Greenhouse Specialists have experience working with and in nurseries, so they can provide helpful advice that can improve the functionality of any nursery greenhouse or business. Greenhouse specialists can also help customers decide on what accessories and systems are right for them. Growers Supply provides a one-stop shopping experience, so no nursery detail is too small. With Growers Supply, nursery owners can outfit their GrowSpan greenhouse with all the necessary accessories for production or retail, including benches, growing systems, lighting, heating and cooling systems, grow media and much more. Work with Growers Supply to create the perfect GrowSpan nursery greenhouse. Call or Request a Quote today.